Kit provides all of the Build-It System components youʼll need to produce any of these beneficial jigs, plus many more. Just connect the parts! The Build-It System is a powerful tool for saving time constructing a countless number of useful jigs and sliding fixtures, and the Build-It Starter Kit is the ideal way to jump in without guesswork. 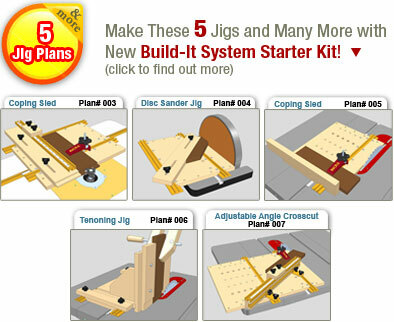 The Starter Kit includes at least one of each Build-It component for exceptional versatility, and the kit even includes start to finish instructions for five handy jigs. Building any of the five jigs is only the beginning; adding a few additional Build-It components allows quickly assembling virtually any jig or fixture you can imagine. Pre-drilled and machined MDF panels quickly screw to the T-Slot Panel Connectors to form an adjustable foundation, and an INCRA Miter Slider simply screws to the platform for play-free travel in any standard miter slot. The T-slots allow easy attaching of other components - 90-degree Build-It brackets, the included Hold Down Clamp, or anything else you might need. Why spend a lot of time building a jig that you'll only use for one project? Much of the beauty of the Build-It System is that in addition to saving time in jig construction, a jig can be disassembled once it's served its purpose and the components reused for a different jig the next time the need arises. The MDF panels are the only item that may need to be replaced after building several jigs, so the Starter Kit is an investment that pays long-term dividends. 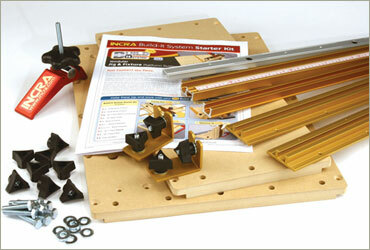 Kit includes all of the Build-It System Components you'll need to produce all of the beneficial jigs and more. Just connect the parts!